(USA TODAY) -- The NBA has mastered the art of controlling the calendar. Just when its time in the global spotlight was coming to an end, with July summer leagues over with and the star-studded Team USA minicamp in Las Vegas also complete, the league on Wednesday announced its national television schedule for the opening week, Christmas Day and Martin Luther King Jr. Day. Fans will have to wait until Friday to feast on the entire schedule. The folks at Nike have to be thrilled with this scheduling, as their top athlete, LeBron James, will start his Los Angeles Lakers career near their headquarters against the pride of Adidas, the Blazers’ Damian Lillard. The Chicago Bulls also play at Philadelphia on TNT on Oct. 18 at 8 p.m. The Warriors will collect championship rings for the third time in the past four years, and the Thunder will get an early chance to send the message that they might be capable of winning one of their own. Kevin Durant and Russell Westbrook facing off again always makes this matchup compelling, but Paul George’s decision to re-sign with the Thunder this summer ensured that it remains a legitimate Western Conference battle. The league is clearly excited about this growing Sixers-Celtics matchup, as these two teams will also meet on Christmas Day. And with good reason. Not only were they neck and neck in the 2017-18 regular season — Boston was second in the East at 55-27 and the Sixers third at 52-30 — but they faced off in the postseason as well. 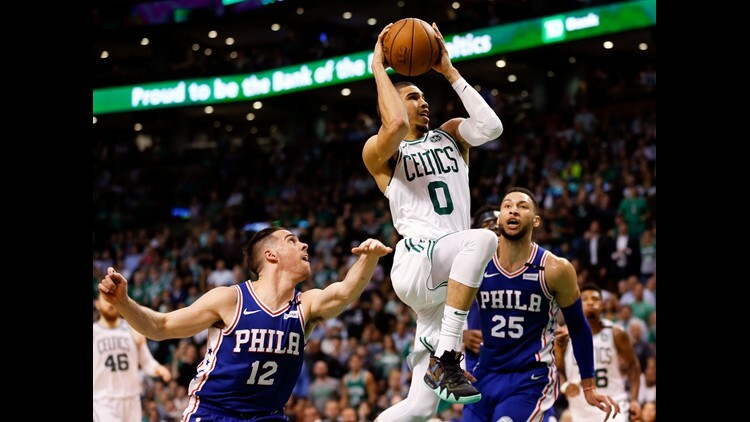 The Celtics bested the Sixers in five games in the second round before falling to Cleveland in seven games in the conference finals. The good news for these teams and every other in the East? LeBron James’ move to Laker Land clears the way for a new, well, king. A NEW HOOPS HOME FOR KAWHI LEONARD – BUT FOR HOW LONG? The former San Antonio Spurs star and two-time Defensive Player of the Year was traded north of the border in mid-July, and the Raptors are hoping he likes it enough to re-sign as a free agent next summer. Meanwhile, the Wizards added three-time Defensive Player of the Year Dwight Howard this summer and are looking to bounce back after a mediocre 2017-18 campaign (43-39; eighth seed in the playoffs and a first-round bow-out to Toronto). The 10-time All-Star has yet to sign his new contract with the Rockets, but it’s expected to be finalized soon. And considering Anthony will be playing for his third team in three seasons, and that he’s coming off the worst season of his career during his short stay in Oklahoma City, he’ll have a lot to prove from the start. Ditto for the Rockets, who came so close to unseating the Warriors in the West Finals and are looking to finish that job this time around. The ESPN/ABC Christmas Day games, which were previously reported, are as follows.